Who cares how much wood a woodchuck can chuck! The real question is how much power can your diesel turn out? Some companies claim to produce insane gains with their modules, but they push motors to unsafe levels. 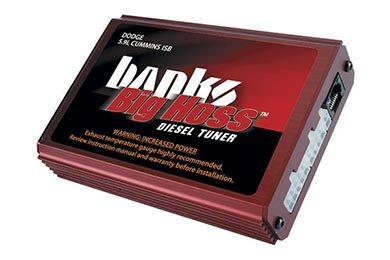 For a big-time blast of energy that won't shred your powerplant, equip your rig with a Banks Big Hoss Tuner. Tow harder, haul more, and pass slow-pokes with ease -- your Banks Big Hoss module unlocks up to 70+ hp and 180+ ft lbs of torque! By reprogramming the signal running into your motor, the Big Hoss unleashes the power that factory CPU settings choke back. Responsible energy goosing is the name of the Banks Big Hoss Tuner's game. It plugs into your EGT probe for automatic temperature limiting, has built-in torque converter protection, and has self-diagnostics software to prevent electrical haywires. Banks is the big dog in the diesel market, and they know how to trick out your workhorse. Plus, they back your Big Hoss with a 2-year warranty. Reference # 766-168-923 © 2000-2019 AutoAnything, Inc.